Three civilians were injured in Avdiyivka amid shelling. One Ukrainian soldier was killed and five were wounded in enemy shelling on Tuesday, May 30. 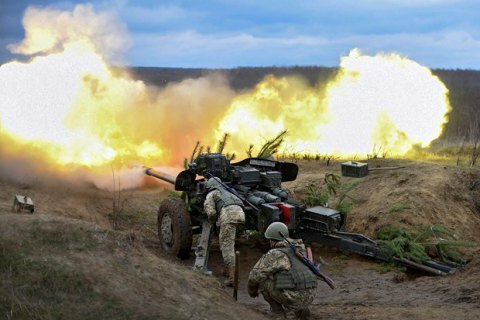 Russian-backed terrorist gangs made 44 shelling attacks against the units of the Armed Forces of Ukraine, including using heavy weapons on eight occasions, ATO headquarters reported on Wednesday, 31 May. In the coastal sector, 24 shelling attacks were recorded. Late in the evening, the enemy fired 120-mm mortars at the ATO positions near Novotroyitske. With the onset of twilight, militants fired small arms and grenade launchers in the areas of Shyrokyne, Hnutove, Berezova, Bohdanivka, Pavlopil, Maryinka and Krasnohorivka. The ATO positions in Krasnohorivka and Bohdanivka were under the fire of the enemy IFV weapons. Enemy snipers activated in the areas of Shyrokyne, Pavlopil and Maryinka. In the Donetsk sector, one agricultural farm near Novoluhanske was shelled yesterday morning. At around 19.45 Kyiv time, militants shelled Avdiyivka from mortars. As a result, three civilians, who were caught by the shelling at a bus stop, were wounded and hospitalized. One of the victims is in serious condition. A mortar shell hit the courtyard of a private house. Fortunately, no one was hurt. Avdiyivka and the suburbs remain one of the hottest spots on the contact line. Only last night, the enemy in this sector has on three occasions used 120-mm mortars that forbidden under the Minsk agreements. Militants repeatedly shelled the ATO defense fortifications from grenade launchers and small arms. In addition, militants fired small arms at the Ukrainian defenders of Pisky and Zaitseve. In the Luhansk sector, militants six times fired grenade launchers and small arms at the strong points of the ATO forces in Krymske, Luhanske, Syze and Donetsk rail station. On May 29, three Ukrainian soldiers were wounded in Donbas.